With holiday memories still fresh and many photos left to download, store and probably never see again, it's to the first of our autumn updates you may wish to turn for sanctuary - and so without further ado herewith enclosed is a selection of fine items that I hope you may find of interest. 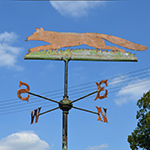 First up, Fantastic Mr Fox - A large (almost life size) Folk Art weathervane with original paint and simply the best one I have ever had. 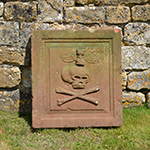 Keeping with firsts (I have never before owned such an object), a Memento Mori carved into a red sandstone panel with the winged sands of time flying above a wonderfully naively carved skull and cross bones - strangely not so gruesome as one would think (stop press - just sold to British Columbia). From the sands of time I suppose it would be best now to talk about sundials.. we have a simple baluster and a wonderful Arts and Crafts pedestal in the manner of Liberty, both carved in Portland stone with the larger being of a comfortable scale and with those distinctive stylized leaves it will make a great focal point. As ever, gates and troughs for all and today even a trough waterfall. Made up from three troughs I purchased from the Estate of Sir Anthony Caro - who was before his untimely departure going to use these troughs to make some great work but as no drawings were left the troughs once more reverted to being humble troughs. I did however fulfil a dream to wander around his studio and saw many works still in production, as well as the great pile of much photographed sheets of rusting steel waiting for their moment, a moment which will now sadly never come. Some 250 years before Caro, another sculptor's yard in London (at Hyde Park Corner to be precise) was creating, predominantly in lead, for the great gardens of the time, sculptures of 'Gods, Goddesses, Pan and frisking Satyrs and an infinite number of mere dancers, haymakers, gladiators..' As seen in an engraving by Hogarth these sculptures and more were depicted in what is believed to be the Yard of John Cheere (1709 - 1787). The Bacchus we have here conforms to his known style and indeed this model is also recorded with similar examples and so we can, with confidence, date him to around 1740. Again a work in lead but this time 200 years later (circa 1930) we have a fountain group 'Boy with Swan' after the original model by Theodore Kalide (1801-1863) - see Osborne House on the Isle of White for another example. This fountain will make a great centre piece and with swirling movement and the water playing from the swan, it will hold a large pool well - as indeed it must once have done prior to being sold in the 1970s at one of those Great British Country House sales - this fountain being provenanced to Hazlewood Castle in Yorkshire. A nicely shaped marble pool surround, an unusual lead dolphin spout wall fountain and an alabaster Venus de Milo wrap up this little collection, though as ever we do have more on the web for you to see. 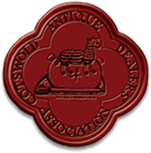 Please do just click onto the item to get a closer look and see more information, sizes, prices etc. 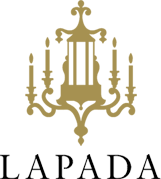 Off to exhibit at 'Landscape' in London at the end of the month - more information on this and our new products to follow. Thank you as ever for your interest and I look forward to being of assistance.